I am not a fan of Royalty, but I do notice the pattern of the day to do a 1984 on history. After the self-serving job on Bill Clinton, here comes a new twist where D Day is celebrated by collaborationists while the actual fighters are left out. 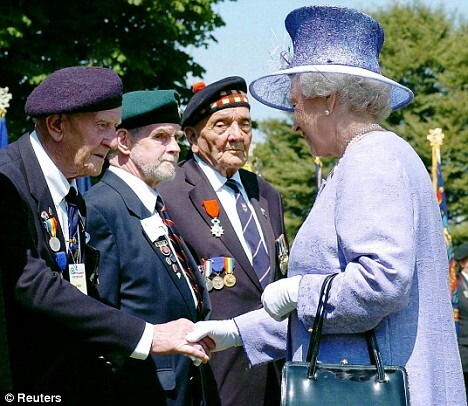 The queen, who is 83, is the only living head of state who served in uniform during World War II. 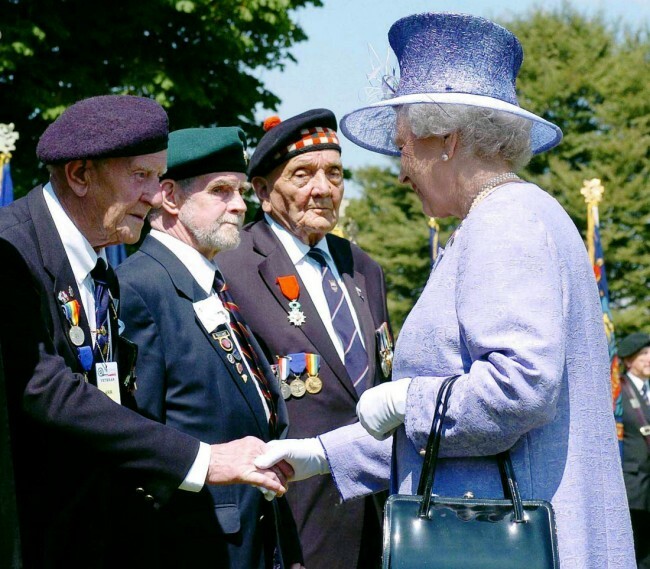 As Elizabeth Windsor, service number 230873, she volunteered as a subaltern in the Women’s Auxiliary Territorial Service, training as a driver and a mechanic. Eventually, she drove military trucks in support roles in England. Sarkozy’s Hungarian-born father celebrated D-Day by fleeing collaborationist Budapest for Nazi-controlled Germany to escape advancing Soviet troops. The same story also alleges that the family of Sarkozy’s current wife, industrial scion Carla Bruni Sarkozy, had been pretty chummy with Mussolini. In Britain, commentators have suggested that Mr. Sarkozy did not want to share the telegenic moment when he hosts Mr. Obama. If the event was design as “Franco-American” – where is the American part in all this? Satire is hard – during times when life is almost too ridiculous to witness. The Onion has occasionally encapsulated a moment in time. Who would have thunk it?.. And another reason for my choice of illustration – the miracle: NYT has a non-acrimonious Bill Clinton profile. (I guess now, that the right puppet is installed, it can be told). Still, as he boarded the plane in Medellín one night, he posed on the tarmac with the local security officers who had been guarding him, as he dutifully does at every stop. He seemed tired and not particularly interested, but he did not complain. Climbing the stairs to leave, though, he noticed some other officers. “Were you in the picture?” he asked. Then to an aide, he said, “These guys weren’t in the picture.” He came back down the stairs and posed again. Talking Point: See? Obama has only been in office five months and already he’s got an Age. An Age, I tell you! He is the most historical-est, bestest Preznit EVAH! And did Bill have a clothing line and his own TeeVee station? I don’t THINK so! Obama Roolz, Bill Clinton Droolz! I am old enough to remember when liberal meant fighting for civil rights and helping the disadvantaged, having a just society, and progress in every field. It stands to reason that in the age of Obama when most “liberals” are silent on torture, gay marriage and right to chose, alternative definitions would be sought. Studies suggest that conservatives are more often distressed by actions that seem disrespectful of authority, such as slapping Dad. Liberals don’t worry as long as Dad has given permission. And I think this is the subliminal point Kristoff is driving. Liberals need to check for permission before slapping “Dad”. The upshot is that liberals and conservatives don’t just think differently, they also feel differently. This may even be a result, in part, of divergent neural responses. Likewise, conservatives are more likely than liberals to sense contamination or perceive disgust. People who would be disgusted to find that they had accidentally sipped from an acquaintance’s drink are more likely to identify as conservatives. Liberals can live with military tribunals, torture and discrimination against gay and women – they won’t object especially as “Dad” didn’t give permission to be slapped. “Obama did not like it and stated it was not helpful to equate me with President Bush”. What does this mean for activists? Just stop! Thus persuasion may be most effective when built on human interactions. Gay rights were probably advanced largely by the public’s growing awareness of friends and family members who were gay. All you have to do is wait for enough gay people to be born in conservative families and voila! So, now that we know the answer to “who’s your Daddy”, how will he deal with those children with the wrong neural responses? A corollary is that the most potent way to win over opponents is to accept that they have legitimate concerns, for that triggers an instinct to reciprocate. As it happens, we have a brilliant exemplar of this style of rhetoric in politics right now — Barack Obama. So, you see kids? Obama only threw women under the bus so conservatives would reciprocate. Just wait for the respect they’ll show to the woman nominated for SCOTUS (without asking her views on the women’s right to choose). It’ll all work out. Nothing is disgusting to the good children, the “special” ones will come around. And be sure to ask permission from Dad before doing anything untoward. In a 2002 case, she wrote an opinion upholding the Bush administration policy of withholding aid from international groups that provide or promote abortion services overseas. But in his briefing to reporters on Tuesday, the White House spokesman, Robert Gibbs, was asked whether Mr. Obama had asked Judge Sotomayor about abortion or privacy rights. Mr. Gibbs replied that Mr. Obama “did not ask that specifically. Why would he? It’s not as if Roe was his “ace in the hole” to con women into rallying for him, was it? Assuming for a second Gibbs is honest about his answer, how offensive is this? “He didn’t even ask”??? Would that be Obama’s “sensible conscience rule” Or simply his royal FU that he could hardly send to women everywhere? leaders of several other abortion rights groups spoke out in support of Judge Sotomayor, and several conservative groups opposed to abortion rights attacked her, saying they were convinced that the president would not nominate someone who opposed abortion rights. Interesting that my cartoon talks about women’s health. Reproductive rights would be another good one. It is why some of the examples of Sotomayor’s decisions picked are so egregious. Ruling to protect Chinese immigrants from forced abortion is a perfectly good pro-choice position. If one is for choice – i.e – “reproductive rights” a forced abortion is no less a restriction of this right as the inability to obtain one. It’s only “unacceptable” for “abortionists”. But who are they, if not straw men of the right and now Obama media?